Kriti Sanon makes us want to pack our bags and go jet-setting somewhere. The actress was posed to perfection as she stood on the stairs of the flight. She was off to Jaisalmer to wrap up her shooting of Housefull 4. She looked beautiful as ever and her outfit was quite soothing. She simply paired her skirt with a denim jacket and a tee. Her skirt was splashed in a blue hue and accentuated by myriad intricate patterns. Her midi skirt was notched up by floral designs and featured an indigo blue-hued border. It was a flowy skirt and was most certainly enhanced by comfort quotient. 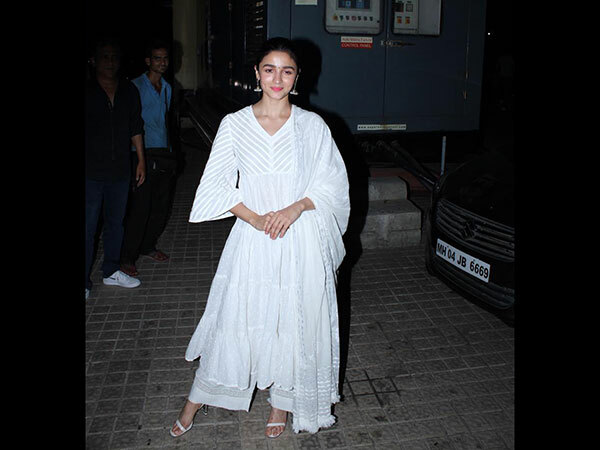 She paired her skirt with a tee and a full-sleeved denim jacket, which complemented her skirt perfectly and gave us the brand new dress goals of the day. She paired her look with blue-hued shades and pristine white sneakers. Kriti's makeup was marked by a deep red lip shade and she left her long tresses loose. Well, Kriti Sanon left us all mesmerised. Didn't she absolutely blow our minds away? Feel free to share your opinions in the comment section.